My conversation with John Zhu is peppered with terms that I abandoned back in high school chemistry class: calcium, magnesium and sodium, total dissolved solids, minerality and pH levels. Test tubes, beakers and Bunsen burners, however, are nowhere to be found. Instead, Zhu and I are sitting at a dining table with a white tablecloth, expensive silverware and place settings, as lush jazz music plays in the background at the Park Hyatt Shanghai’s Dining Room restaurant, 87 floors above ground. And, Zhu isn’t a science teacher. He’s one of a few certified master water sommeliers in China, and tasting water from around the world is his full-time job. The Australian-Chinese sommelier, who has been involved in luxury water for almost a decade, is also the founder and CEO of Purelogica, an importer and distributor for luxury water brands in the Greater China region. Besides Park Hyatt Shanghai, several other luxury hotels such as the Aman Summer Palace, Ritz-Carlton Beijing, St Regis Tianjin and Waldorf Astoria Shanghai on the Bund are also using its luxury water collection with bottles from Norway, Greenland, Slovenia, Canada, Chile and the UK. Water sommelier is a relatively rare profession; there are just a few countries around the world that offer professional training programs to learn the trade. Zhu, who received his certification from the Korean International Sommelier Association (KISA), established the Purelogica Academy in 2016. Designed in conjunction with KISA, this program provides water knowledge and practical training for frontline staff in some of the country’s most luxurious hotel restaurants. In the last year alone, 69 students in China have received the entry-level water sommelier certificate. In front of us are five bottles of luxury water that Zhu supplies to the hotel, and the prices range from RMB118-385 per bottle. “The most expensive bottle in our portfolio is actually the Iluliaq ‘iceberg water’ from Greenland; it’s RMB1,500 a bottle,” Zhu explains. "The most expensive bottle is the ‘iceberg water’ from Greenland; it’s RMB1,500 a bottle...you’re actually tasting water from 100,000 years ago"
The answer is simple, according to Zhu. “It’s because of the production volume. Every year, these producers only bottle a small quantity to minimize damage to the source’s natural habitat. As a result, we cannot achieve economies of scale like mass-market commercial brands. Also, these places are isolated from human activity, and that leads to expensive logistical costs.” Adding to the equation, the water brands in Zhu’s collection are packaged in bottles created by award-winning design firms and are specially produced by an Austrian manufacturer. A recent report by EMKT.com.cn (a Shenzhen-based market research firm affiliated with McKinsey) states that the sales for premium bottled water (including domestic and imported brands) in China hovers at around RMB10 billion per year as of early 2017, and this, according to Zhu, is only a small fraction of the global market. If you look at the general bottled water market, China has for the past few years surpassed the US as the world’s largest consumer by volume, increasing from 19 billion liters to 37 billion liters between 2010 and 2015, according to consultancy firm Zenith. Days after our meeting with Zhu, Coca-Cola introduced Valser, a premium Swiss sparkling water label, on e-commerce platform Tmall. At the time of writing, two 750ml bottles cost a whopping RMB98. It looks like commercial giants share Zhu’s confidence in the market, but can consumers taste the difference? Water sommeliers meet skepticism about their line of profession all the time, and some even say the job is a marketing gimmick. “People always ask me, ‘Doesn’t all water taste the same?’” A short version of his answer to this question is ‘no,’ and Zhu says he usually conducts a water tasting session to prove his point. “It’s pure geology,” he adds. Much like wine and coffee, the taste of the water is affected by the origin of its source and the surrounding geological formation. This is an integral part of a water sommelier’s basic knowledge. Water from Western and Central Europe is high in minerals, while those extracted from Latin America, South America, Asia, Australia and New Zealand have relatively low minerality as the rock formations are much more solid and the chemical elements don’t dissolve easily into the water. “Basically, if the level of total dissolved solids (TDS, a measurement of minerality in water) is low, the water is very crisp and pure. As the TDS level rises, minerals add taste and character to the water,” Zhu explains, while opening a bottle labeled ROI. It’s a rare naturally carbonated water from Slovenia, a country known for its thermal spas with water containing high levels of magnesium and calcium – an all-natural muscle relaxer. from a confined chalk aquifer in the UK – it has a slightly sweet taste and a thicker ‘texture’ that is best paired with savory items like cured meat and roast pork. “It’s almost like milk that has been filtered multiple times,” Zhu explains while I take a sip. I can’t detect the sweetness, though the creamy mouth-feel is immediately noticeable. For desserts made with dark chocolate, a pairing with high-sodium water such as the Canadian gold-filtered mineral water, Gize, can bring hidden sweetness to the surface. When compared with Elsenham, Gize is much lighter in texture and a touch saltier too. While every sommelier around the world has his or her own way to conduct a tasting, he tells me that the compare and contrast method he uses is usually the standard approach. “What’s your favorite?” he asks. I’m surprised at how quickly I’m able to choose one – the Slovenian bottle, mainly because of its distinct flavor. Perhaps, the gimmicky façade is a way for water sommeliers like Zhu to show people how interesting water is. Raising awareness about the importance of protecting water sources is something that Zhu also hopes to achieve with his Purelogica Academy. 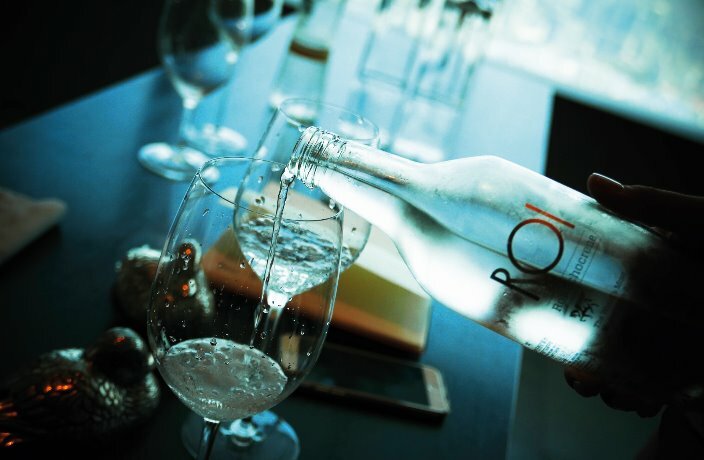 He sees his collection of luxury water as an important tool to educate not just the folks within the F&B industry, but also the general public, about the issue. Visit www.purelogica.com to learn more about its luxury water collection. Ensure your drinking water is up to standard with this magnesium mineralizing pitcher. Imported from the UK, this spring water is available right now on thMart. Now that Shanghai Metro Line 17 is open, here's your guide to exploring Zhujiajiao, the city's best known water town. Looking to optimize the quality of your water? Look no further than these BRITA products, which are on sale right now.